23 Results exactly matching the search phrase. 115 Results matching titles words. 239 Results matching product descriptions. 302 Results matching title or description. This HDMI 1.8m cable (Black) is useful for High Definition signal transfer between HDMI enabled devices. Supports Standard def and High def video of 480i/p ~ 1080i/p@23/24/59/60/72/75/85Hz. Quality components and technical design enhance the operating performance of the HDMI 1.8m cable at high speed data rates. Connect your XBox, Playstation or BluRay DVD (3D) players to your HDTV for perfect picture and sound. 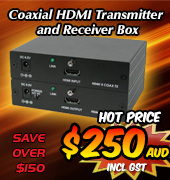 The HDMI to HDMI Scaler Box is designed to scale HDMI video and audio sources between various HD and PC resolutions. Both input and output support resolutions up to 1920x1200@60Hz (RB) and the unit is compliant with the HDMI 1.3, HDCP 1.4 and DVI 1.0 standards. The HDMI 12 Way Female to Female Patch Panel is used for HDMI cable management in specialist 19" Equipment Racks. Organise up to 12 separate HDMI devices such as DVD players, Set Top Boxes, Game Consoles, Amplifiers, PC's etc for connection to HDMI sink devices such as HD monitors, HDTV's, DVD recorders etc. The HDMI 1 In 2 Out Splitter copies one HDMI video/audio stream into two equal HDMI output streams. Each output is equal in quality and strength, working up to a distance of 15 metres without loss or degradation to the signal. 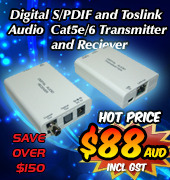 1 x 8 HDMI 1.3 Splitter allows you to split a single HDMI source to eight outputs, without signal loss or deterioration. Connect your DVD player, PC or Game Console to display to eight separate screens. Supports PC resolution up to UXGA and HD up to 1080p. Ideal for shop signage displays and video distribution between and around large rooms or buildings. The 3D HDMI 1 In 2 Out Splitter with audio is fully compliant with HDMI v1.3. It allows the output from any HDMI equipped device, such as a 3D DVD or Blu-ray Player, to be split equally and connected to two HDMI displays, such as a HDTV or a HD projector in the same room. The third HDMI output is an audio with blue screen output, which means it can be connected to an AV Receiver that does not support 3D signal. HDMI 1 In 4 Out Splitter directs one HDMI video/audio input stream into four equal HDMI output streams. Each output is equal in quality and strength, working up to a distance of 15 metres without interference. Supports up to HD resolution WUXGA/1080p@8/12 bit colour, 3D video and up to 7.1 channels of high definition lossless audio: LPCM, Dolby Digital, Dolby Digital Plus, Dolby TrueHD, DTS, and DTS-HD Master Audio transmission. Compatible with DVI systems using a DVI to HDMI adaptor cable or converter. PC to HDMI 1080p Scaler Box is designed to upscale video from a PC input source to a digital HDMI output at a range of different resolutions up to 1080p/WUXGA. The unit is particularly useful for those who want to display the image from their PC on a high definition TV at a high resolution. HDMI 1 In 8 Out Splitter directs one HDMI video/audio input stream into eight equal HDMI output streams. Each output is equal in quality and strength, working up to a distance of 15 metres without interference. Supports HD resolution WUXGA/1080p@8/12 bit colour, 3D video and up to 7.1 channels of high definition lossless audio: LPCM, Dolby Digital, Dolby Digital Plus, Dolby TrueHD, DTS, and DTS-HD Master Audio transmission. Compatible with DVI systems using a DVI to HDMI adaptor cable or converter. 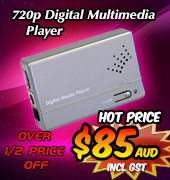 HDMI-Video-PC to HDMI Switcher which is designed to convert analog and digital signals to HDMI 1.3 output and includes HDMI, PC, Composite, Component and S-Video Input options and outputs to your connected display via HDMI. The HDBase-T HDMI 1x3 over HDMI & CAT5e/6/7 with RS232/LAN/IR Transmitter supports SD/HD resolutions of up to 1080p Full HD, Deep Color and 4Kx2K timing, and 3D and multichannel digital audio formats such as LPCM 7.1CH, Dolby TrueHD, Dolby Digital Plus and DTS-HD, from Hi-Def sources. It takes the signal from any one of these sources at a time and transmits the signal up to one HDMI and two CAT5e/6/7 outputs. New HDMI 1 In x 16 Out 4k2k Splitter is designed to support latest technology UHD (ultra high definition), 3D format 12-bit Deep Colour video signals, along with HD (high def) Lossless Audio. One HDMI video signal is divided into 16 separate but equal video signals, all without signal loss or distortion. With 3Gbps of Bandwidth and latest release HDMI protocol, this unit is ideal for any situation. The HDMI v1.3 to CAT6 4 In 4 Out Matrix distributes up to four HDMI 1080p inputs to any of four RJ45 outputs, transmitting each output over twin CAT6 cables up to a distance of 50m. New HDMI 1 x 4 Video Wall Controller allows a single HDMI video source to be displayed over 4 (2x2) HDMI TV's or monitor's, or cascade with additional units to extend the number of displays in the video wall configuration up to 36 (6x6). The user-friendly PC based control applications allows full managability of single or multiple devices in a Video Wall system, including picture adjustment and full bezel correction.